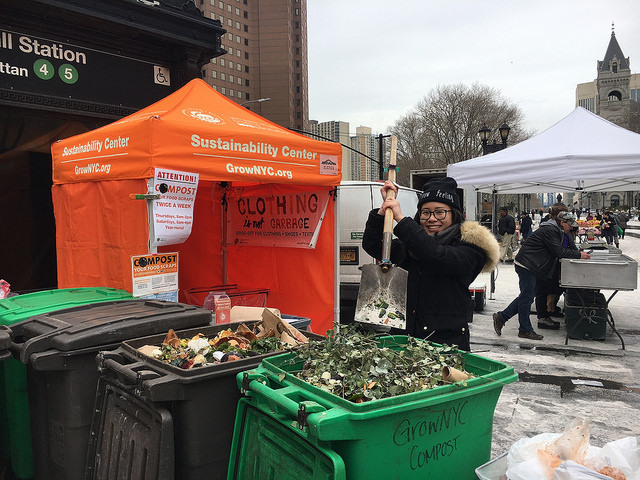 GrowNYC collects food scraps and other organic waste at various Greenmarkets around the city to distribute to local compost partners in the surrounding area. 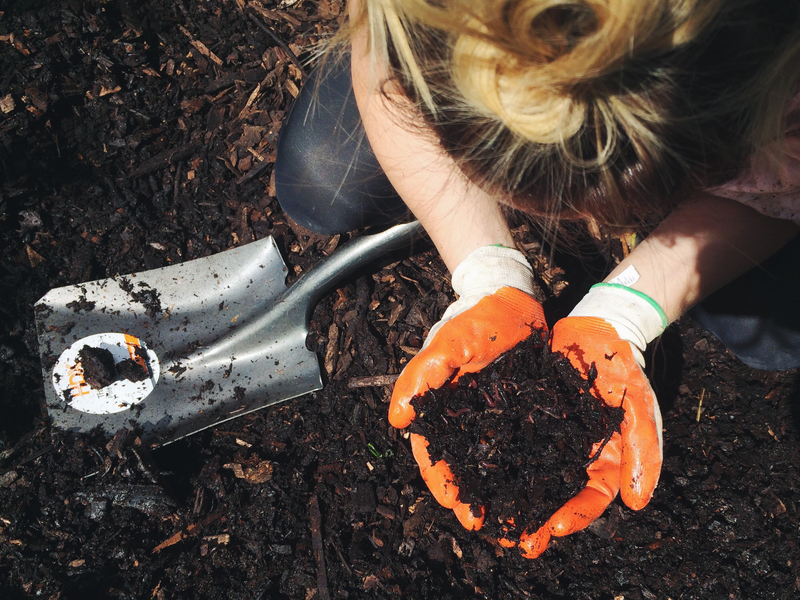 With the help of community volunteers, New York City’s recycled food scraps are transformed into a nutrient rich soil amendment for farming and greening purposes throughout the five boroughs. A few minutes’ walk from the F train, Gowanus Canal Conservancy’s (GCC) Salt Lot hosts a monthly compost windrow build for volunteers from around the city. November’s volunteers included about a dozen students from the Brooklyn Technical High School’s Red Cross Club, a group of elementary students from a Bed-Stuy Charter School, and a myriad of volunteers simply happy to enjoy an outdoor-community activity. Sam and Maria Pruden of Harlem join GCC monthly to participate in composting. Behind Sam and Maria is an illustration of the compost build and process. 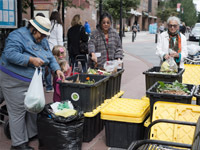 The volunteers arrived ready to tackle the record-breaking 10,000 pounds of food scraps that had been collected from four Greenmarkets the day before. The bins of food scraps are dumped and mixed in a large pile on the ground with leaves and yard scraps, taking about 4 hours. The pile, or windrow, will sit for two weeks, and then be turned by a GCC staff member once a week for the following four weeks, before it is sifted to make a final product. At the end of these six weeks, GCC has a fertile soil amendment for tree pits and rain gardens that help prevent polluted water from entering the canal. Two students from Brooklyn Technical School’s Red Cross Club carry a bin of food scraps to the compost pile to be mixed with leaves and other dry yard trimmings. 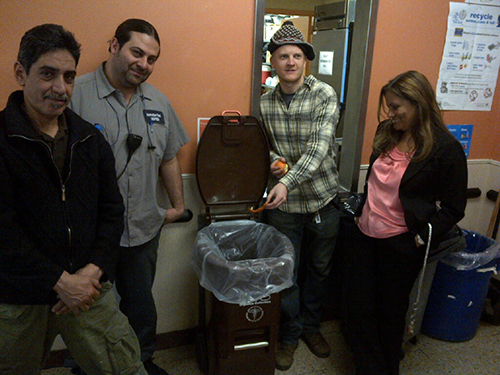 GCC Coordinators Jared McGuire and Christine Petro, sift processed compost to make final product with a Bed-Stuy group leader. Jared McGuire and Christine Petro, GCC Volunteer Coordinators. 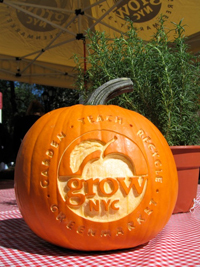 Since 2011, GrowNYC has worked to expand food scrap collections at Greenmarket. 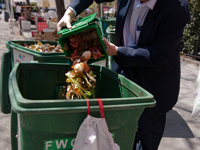 In partnership with the NYC Department of Sanitation, the program has grown to 30 markets, averaging 100,000 pounds a month diverted from disposal and used locally for renewable energy or fertile compost for urban farms, gardens and more. To date more than 2 million pounds of food scraps have been dropped at market, which would fill enough of our collection boxes to create a stack taller than Mount Everest! But the impact is even greater: every apple core deposited in a compost bin has been a vote for increased composting citywide, which has come to fruition with the Department of Sanitation’s new Organics Collection Program. Keep on composting!